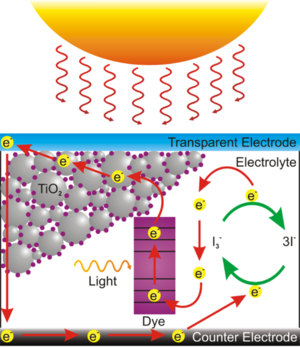 This dye sensitized solar cell, also known as a Graetzel cell uses a thin film of titanium dioxide which has been ground to a fine powder (nanocrystalline) to increase its reactive surface area. The TiO2 is sandwiched between two glass slides that are coated with conductive and transparent indium tin oxide (ITO). The TiO2 is impregnated with some kind of colored dye, in this case anthocyanin from raspberry juice, which is the chemical which first traps the solar energy and passes the charge to the TiO2. Finally the space between the slides is filled with an liquid electrolyte solution of potassium iodide which serves to transport charge (by way of a redox reaction) from the bottom electrode to the dye to complete the circuit. The efficiency research cells is 11-15%, this berry demo cell is likely <1% efficient.